Plans to float Naza TTDI Sdn Bhd remains in its keep-in-view file, but may well resurface as the developer makes strides towards a top spot in Malaysia's as well as region's property market. Naza TTDI and I&P Group Sdn Bhd (formerly Island & Peninsular Bhd) are two of the big Malaysian property companies under private ownership. It made a grand entry into the big league last week when Prime Minister Datuk Seri Najib Razak performed the groundbreaking ceremony for the Naza group's 50-storey corporate headquarters located in the high-value Kuala Lumpur City Centre area. The Naza Tower makes up one of the buildings in the group's RM4.1 billion integrated upmarket commercial and residential property project known as Platinum Park. Traditionally a developer within the Klang Valley, Naza TTDI group managing director SM Faliq SM Nasimuddin said it was looking for more land to widen its offerings. In an interview with Business Times last week, he said the company was studying options outside of Kuala Lumpur and had been quite impressed with prospects in Iskandar Malaysia in Johor. "Taking the company to the next level is my goal and I think, with the brand, we can do that," Faliq said. The 24-year old, who was thrusted into the boss' seat after the demise of Nasimuddin last year, has settled in comfortably and now speaks like a seasoned property man. He did not discount the possibility of plans to float Naza TTDI, once mooted by Nasimuddin, being revisited. "Eventually we want to become a big player in the property sector," he said. Like clients of the Naza motor vehicle division, Naza TTDI has built a big following over its three decades of existence, Faliq said. He attributed the strong support to the quality of products and services Naza TTDI delivers. Helmed by experienced managers, it has delivered ahead of schedule several times. The company has the tradition of hiring reputable planners and architects for its projects, adding much value to the properties either in terms of comfort or capital appreciation. Its Platinum Park looks to be a sure winner. With one tower sold to Felda, another 50 storeys designated as the group headquarters and a 30-storey building sold to a government-linked company (GLC) that Faliq did not name, the project is already funding itself. The buyers of Platinum Park units are expected to enjoy good capital appreciation. The entire project is scheduled for completion in 2018. Naza TTDI is also a lowly-geared company, with total debt of just about RM100 million. It borrows on a project-to-project basis. Faliq wants to keep it that way and, with properties being snapped up before the projects are even officially launched, he foresees little problem. Current total gross development value of Naza TTDI's projects in the Klang Valley is about RM8 billion. The company has not been afffected much by the weak economic environment and sees no reason to halt new ventures. It has been fortunate in that the Platinum Park tower sale to Felda was effected just before the crisis. Then it managed to sell a tower to its parent company and a building to a GLC. "We have unbooked sales of about RM1.4 billion so we are sitting quite comfortably to take us through the next three to four years," Faliq said. Naza TTDI's Laman Seri Business Park in Shah Alam was sold out about a week ago. Another high-value residential project, The Valley, in Ampang will be launched soon. Faliq said the company was interested in exploring opportunities in other states in the country in addition to identifying projects in Vietnam and China. "It's new to us, but, eventually, if we want to be a regional developer, we will have to venture outside of Malaysia," he added. 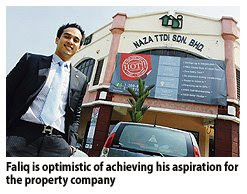 Naza TTDI aiming to achieve big progress this year. Tomorrow they will be announced winners at the International Property Awards. Visit the site for more info.